Connetquot High School teacher Nancy Dunlop has announced another successful conclusion to the Daffodil Days fundraising effort. According to Mrs. Dunlop the District raised $3500.00 for the American Cancer Society through the Daffodil Days promotion. This effort represents the largest monies raised by any district in Suffolk County. In addition to the generous sales of daffodils, Mrs. Dunlop was please to add that 16 community members also purchased 'Gifts of Hope.' These $25.00 donations afforded for the delivery of flowers and teddy bears directly to cancer patients in area hospitals. The year's fundraising effort was coordinated by members of the Connetquot Teachers Association, building secretaries, central office personnel, food service workers and custodial staff. 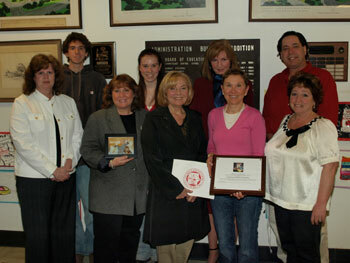 Mary Ann Casalino again coordinated the Daffodil Days effort at Ronkonkoma Middle School. Connetquot High School's Helping Hands Club, under the supervision of advisors teachers Sue Schiappa and Lauries Schwartz, wrapped and packaged the flowers for delivery. "Daffodil Days represents the chance to fight back against cancer by raising funds and awareness," explains Anne Thorenson of the American Cancer Society. This donation will help fund groundbreaking cancer research,as well as advocate meaningful public health policies that benefit the community. Conratulations to Mrs. Dunlop, the Helping Hands Club and the entire Connetquot community for their efforts to help fund education and encourage early detection against this deadly disease.